Question: How long do you spend thinking of course titles? 2 seconds? 2 minutes? Whatever your answer, chances are it’s not long enough! Course titles may seem frivolous, but with hundreds of thousands of courses in LearnUpon, we can honestly say the title makes a big impact. Fortunately, writing a compelling title isn't difficult. With the following tips and a bit of thought, you can create titles that get learners clicking and completing your courses! Every course you build will have certain keywords that you have to include in your title. Explainer words are the central information that describes what your course is. You need to identify them, then shape the rest of your title around these keywords. To do this write out a short description of what your course is about and then pick 2-3 words that you believe sum up your course. To see this in action, let’s use an example of a software company teaching it’s marketing team basic Photoshop. From this short descriptor, we can pick out a few keywords - Photoshop and social media. These will be the basis of our title. As with all of your course content, the title of your course needs to be appropriate for your audience. It needs to grab their attention, but also speak to what interests them and in a tone that is suitable for them. You can find out what interests them by digging into your LMS’s reports and finding out what previous courses they have clicked on. You can also look at other courses, blogs, and content outside of your organization that interests this group and take inspiration from that. For managers, a more corporate, streamlined title might catch their attention. For new employee onboarding, an uplifting and exciting title may get them eager to learn about your company. 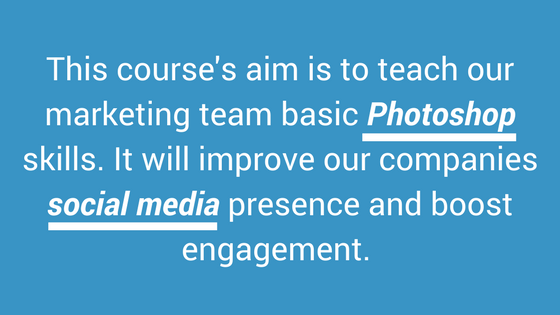 Or with our marketing team example, we can go with a direct, fun title to entice them to click into our course. A clever way to get people to click on your course is to appeal to why they are taking your course. In other words, their motivation. There are two effective ways to do this - learner's problems or goals. One learner may have a problem understanding your organization's HR software, another may want to complete their annual compliance training - whatever the reason, figure it out and use it as a way to appeal to your learners. Looking back at our short description, we can gain some insight into why our learners might take our course - e.g. to improve social media engagement. So let’s use this in our title! Alternatively, you can do some qualitative research and ask people who have or may take your course why they would be interested in this content. It should give you some interesting insight into their motivation. Now you’ve got the key components of a title, it’s time to brainstorm. Do this alone or even better with a team; write down ideas and variations of what your course could be titled. To brainstorm start with the keywords and motivation and start pairing them together to create different versions. You can create as many title variations as you like, but 5-10 is a good number to aim for. Once you have your 5-10 titles, start whittling them down and removing the weaker titles until you find the strongest one that will connect with your audience. To take your course titles to the next level experiment and test them. You can do this by tweaking the title each time a course is released to see how it performed against the last. You can also A/B test your course titles. Simply offer half your learners a course with one title and offer the other half a different title to see which one gets the most clicks. This optimizes your titles and ensures you’re getting more learners doing your course. Clickable course titles aren’t difficult to achieve. With some thought and a little trial and error, these tips could really benefit your learners and your organization.